Imagine if you could reveal a card that has been simply peeked at while your back was turned; without looking at the face of the cards or asking any questions... Imagine if you could reveal this thought of card in such a way that it would seem like real mind reading... Imagine if you could turn a card effect into a powerful and emotional piece of magic... Imagine an effect that is super simple to perform, as the cards used provide you with all the necessary information... Do not imagine anymore... This is Pure Telepathy. 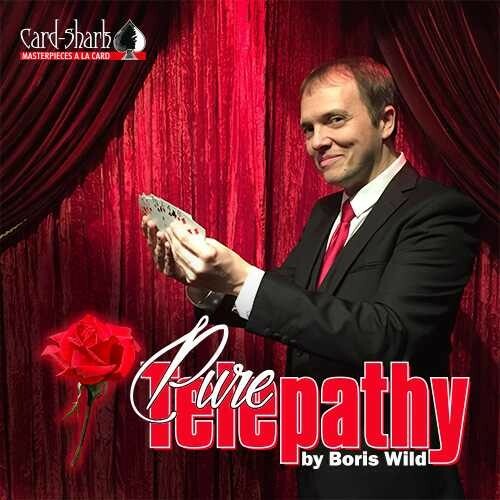 From the creative mind of FISM winner Boris Wild comes another jewel of card magic. This is one of his favorite card routines that he performed on the famous French TV show "Le Plus Grand Cabaret du Monde". While Boris had to use a memorized deck to perform this fantastic routine, this release brings his well known Pure Telepathy routine to a whole new level. Very easy to perform. No memorization or calculations necessary. The included red Phoenix Deck with Large Indexes does all the work for you! Perfect in parlour conditions for optimal visibility. The 90-minute DVD includes the full explanation of the entire routine along with several variations in english and french language. As an exclusive bonus, Boris teaches you how to perform Pure Telepathy with five spectators on stage each thinking of a card from the deck! Comes complete with a transparent mesh bag used for Parlour / Stand-up situations. Este artículo no trae instrucciones en castellano sino un DVD explicativo en inglés y Francés.